What is interesting about the tsunami of change sweeping through the Middle East this past month is that the “dumb, undeserving-of-democracy” Arab masses have turned out to be magnificently saavy, efficient , focused and determined in flipping over longstanding dictatorships. And it turns out they are polite too. Arab populations from North Africa, the Levant and the Persian Gulf have now, quite organically it seems, devised a wait-your-turn system for overthrowing the Middle East’s iron-fisted leaders. Opposition groups and ordinary citizens have come to the streets in Yemen, Jordan, Palestine, Bahrain and Algeria recently to air their grievances and demand change. But they are not going full throttle quite yet. First, they are waiting for the brothers and sisters in Egypt to finish. As Egyptians did when Tunisians were focused on overthrowing the 23-year-old dictatorship of now deposed president Zine El Abidine Ben Ali. When the Egyptian security forces sent thugs onto the streets to foment chaos and turn folks against the protestors, Egyptian bloggers and commentators hit the media and social networks to warn about these tactics – quickly pointing out that Ben Ali’s presidential guard had attempted the same a few weeks ago. When the inevitable US and Israeli warnings came about Islamic fundamentalists hijacking the protests, the moderate Muslim Brotherhood (Ikhwan) released statements to the contrary and aligned themselves behind Mohammad El Baradei, a secular, Nobel Peace Prize-winning, potential presidential candidate. When warnings came that Egypt’s Coptic Christians – ten percent of the nation’s population – would be targeted by the “mobs,” not only did that not happen, but Copts formed human chains to protect their fellow Muslims from government forces during prayer time. It was literally just one week ago when American and mainstream Arab commentators were saying that what happened in Tunisia could not possibly happen in Egypt. That even if Egyptians hit the streets, it would take much, much longer to impact the entrenched government of Hosni Mubarak, if at all. Instead, in seven days, Egyptians of all stripes – young, old, male, female, religious, secular – have fundamentally rocked the 30-year-old regime of President Mubarak. They have sought to keep the revolt peaceful. When security forces became aggressive, protestors fell to their knees in prayer, evoking some of the most emotional pictures of this uprising yet. They have nipped rumors in the bud swiftly, they have sent their rank and file to speak to the world’s media, they have put aside differences to speak with one voice. That voice – en masse – is not demanding lower taxes or higher subsidies as would be expected from a people whose per capita income amounts to less than two dollars per day. It is demanding the removal of their president, a fundamental change in the constitution and the reform and re-election of all political bodies. A closer examination of the governments under threat in the wider Middle East shows that they are all US allies – regimes that we have supported regardless of their human rights records or their ability to govern fairly and effectively. None of them are on the side of that famously maligned axis consisting of “Iran, Syria, Hezbollah and Hamas.” Those state and non-state actors will not be directly touched by this tsunami of unified popular protest – and neither will Qatar, Oman, Iraq and Turkey. 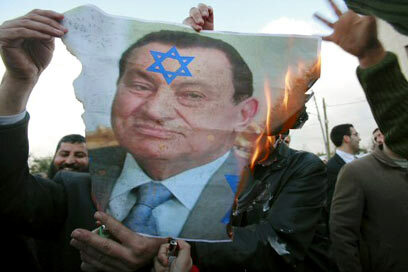 But don’t be mistaken that the Arab masses are unleashing an Anti-American revolution in the region. In fact, while they dislike US policy, there does not seem to be a specific rage directed at Americans at all. This smarter-by-the-second Arab Street realizes full well the reasons for the US’s rotten policies in the region, – primarily its blind commitment to promote Israel’s interests and “security” above all else, including its own. So while most American politicians and pundits remain “concerned” about the spiraling events in Egypt, it is Israel and its US allies who are really, truly splitting a gut. It turns out that the “We’re-the-only-democracy-in-the-Middle-East” crowd are eminently satisfied with the dictatorships around them. It is the only way they look good by comparison. And the only way they can control Arab masses and regional narratives, both. As news breaks today that Jordan’s King Abdullah has dissolved his recently appointed government, you can practically see the realization dawning on some of the region’s most vociferous supporters of US and Israeli hegemony in the Middle East. Jordan has seen spurts of protests these past few weeks, primarily against Prime Minister Samir Rifai who, to be fair, didn’t have much of a chance to prove his mettle, if indeed he had any. But alas, I think Abdullah’s move to preempt Tunisia and Egypt-style repercussions has just flipped the focus onto himself. The King of Jordan may now be the first monarch hit by the popular regional discontent. Which effectively means that with Lebanon’s new “quiet” shift toward the opposition, Israel may soon be facing on all three borders its worst nightmare. Arab masses, fed up with repression, implementing democracy with the support of worldwide audiences…willing, able and experienced in righting injustices peacefully and responsibly. And getting in line to help each other do it right.